Two recent sets of events give a particular poignancy to this book. In the spring of 2001, my longtime friend and the coeditor of this book, Kurt Bergel, passed away after a brief illness. Kurt spent his life devoted to living according to the ethics of reverence for life, and he died a person of conviction, compassion, and love. In the autumn of 2001, the World Trade Center and the Pentagon were attacked, and many died. Since then, many more have died in Afghanistan, Palestine, Israel, and elsewhere in the world, and the pain and death continue. 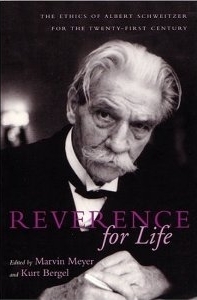 If ever there was a time for reflection upon Albert Schweitzer and reverence for life, it is now. We search to find meaning at such times of pain and death. In the light of recent events, I thought of what Schweitzer wrote more than once about what he called the fellowship of those who bear the mark of pain. In Out of My Life and Thought Schweitzer observed, "Those among us who have learned through personal experience what pain and anxiety really are must help to ensure that those out there who are in physical need obtain the same help that once came to us. We no longer belong to ourselves alone; we have become the brothers and sisters of all who suffer." According to Schweitzer, such people constitute the fellowship of those who bear the mark of pain. We know who these people are. They are the friends and relatives of those who suffer, of those who pass away and leave the rest of us behind. They are the people of New York and Washington, D.C. who carry on through it all. They are the people of the United States who wipe away tears and dig through rubble. They are the Palestinians and the Israelis who see their loved ones die in the streets. They are the people of Afghanistan who have suffered so much for over two decades. They are the many other people throughout the world who have gone through pain, grief, and injustice and have found a way to continue on in their lives. All of us who feel the pain and experience some healing are members of this fellowship. All of us are the brothers and sisters of the suffering; we all belong to each other. The question and challenge Schweitzer raises, then, is: what shall we do about it? How do we work to alleviate the suffering of our brothers and sisters -- whoever and wherever they are in the world? In the present climate that includes the rhetoric of hate and the promise of vengeance, how can we become instruments, not of violence, but rather of justice and healing and peace? These are some of the questions that this book seeks to address.